To love truth for truth’s sake is the principal part of human perfection in this world, and the seed-plot of all other virtues. John Locke, Letter to Anthony Collins (1703, p271). I can’t say that I fully understand the meaning of the quote or, as much as I do understand what it means, agree with it, but I’m guessing that Extinction Rebellion starts with it to draw attention to the fact that people in general are not being told the truth about the ecological breakdown currently underway around them. The truth that in less than a half century, one species – ours – has wiped out 60% of the populations of all other species of mammals, birds, fish and reptiles, has somehow failed to register in the popular psyche. The truth that we have just over one decade – 12 years – in which to reduce carbon emissions by 45 %, and barely three decades – 32 years – to reduce net carbon emissions to zero or lose the opportunity forever to keep the temperature of the earth below 1.5 degrees, has also got lost in the, ahem, ether. The truth that if global carbon emissions continue at their current rate, by 2100 – when children born today will be 82 – the earth will have warmed to 4.8 degrees. Where no refuge is available, and crops and water supplies fail, civil war and a collapse into race or community conflicts seems – sadly – the most likely outcome. By and large history teaches us that humans do not sit and starve in situ when times get bad – they take what weapons they can find and move to more promising regions, triggering warfare with whatever groups already inhabit the contested area…Conflicts which were once fought with spears and swords, however, will now be fought with guns, grenades or nuclear weapons. Six Degrees: Our Future on a Hotter Planet, p 212. Divergent UK tabloid newspaper coverage of anthropogenic climate change… may diminish public support for concrete greenhouse gas mitigation programs when the time for behavioral change comes. Boykoff and Mansfield, 2008, p7. The transformation of the planet and the degradation may be the biggest and most important story of our time, indeed of all time, but on television, at least, it has nevertheless proven, so far, a “palpable ratings killer”. 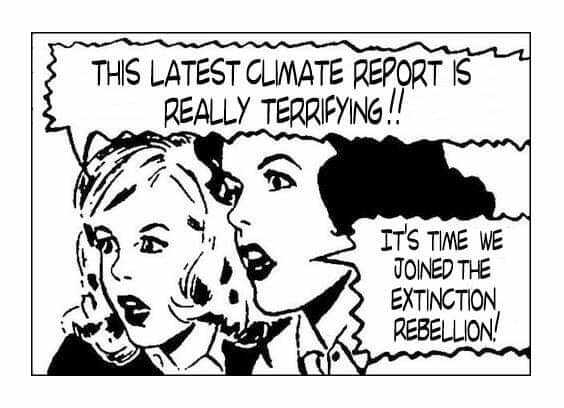 Extinction Rebellion’s strategy for helping people to face up to the truth of climate breakdown – a term George Monbiot prefers to climate change – is direct action. “Hope dies, action begins” is a depressing juxtaposition of clauses. I assume RisingUp! utilise it because hope is a passive gesture that displaces responsibility for action somewhere else, typically one’s government. Unfortunately, governments around the world are either disempowered to act or willingly refuse to act either individually or concertedly to address the crisis we face. In June 2018, the British government’s transport secretary Chris Grayling gave the go-ahead to build a third runway at Heathrow airport. The following month, energy secretary Claire Perry gave permission to Cuadrilla to begin fracking in Lancashire. Furthermore, successive British government budgets fail to acknowledge, let alone budget for, appropriate measures to combat global emissions – see for example George Osborne’s 2016 budget or Hammond’s 2017 and 2018 budgets. Such action, and inaction, on the part of the British government – and governments globally – is an abrogation of a government’s prime directive, and undermines both the justification for and legitimacy of the social contract on which the State depends. This post is not the place to embark on a detailed discussion of political obligation (but see this overview by Stanford’s Encyclopaedia of Philosophy). The point is that governments are not responding sufficiently to avert the sixth extinction of non-human species and, if current emissions trends continue, the extinction of homo sapiens – possibly within a generation. It reminds me that action is a way out of the pit; that I have to *do* something . It reminds me that there is a choice between light and darkness. But it also reminds me that action requires sacrifice. It’s not heroic, and it probably will hurt, but right now it’s the only light I can see to guide me out of the tunnel. I think that’s what Extinction Rebellion is about too, and I ‘joined’ the rebellion formally on Wednesday 31st October 2018. I’d been joining it for a while, but you don’t really join a movement, do you, you participate in one. I went to Parliament Square, listened to some impassioned speeches and participated in a sit-down protest that blocked the street for a few hours. The next time will be on the 17th November, same time, same place. I intend to be arrested. And so it will be, whatever the consequences. “Courage calls to courage everywhere” as Millicent Fawcett once said. I hope you will consider joining the global health rebellion too. Previous Post Global warming caused this Summer’s heatwave – there, I’ve said it!